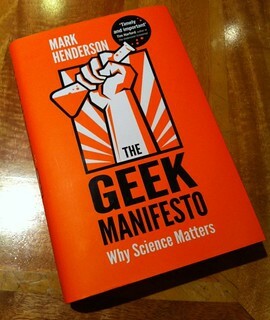 Mark Henderson’s The Geek Manifesto is a remarkable book. Though many of its themes are not new, it is difficult to imagine such a book being published as recently as five years ago. The Geek Manifesto provides a timely analysis of the power that different groups of geeks have levered from the growing sophistication of the of the internet. It examines several recent campaigns that have had notable influence in the UK, including battles to prevent science from being stifled by the libel laws and to stave off the threat of cuts to the science budget. Henderson draws out the reasons for their success but is careful also to point to the challenges that lie ahead. Henderson’s aim is not simply to encourage geeks —web-savvy skeptics drawn from many walks of life — to form a pro-science lobby. Rather, The Geek Manifesto is a rousing call for the scientific method to become more enmeshed within the political process. Henderson ranges across healthcare, education, justice, environmental policy and the media, examining the opportunities for infusing greater rationality and respect for evidence into policy formulation. He builds a compelling case. It is an optimistic program but the author fixes a critical eye on the problems that it faces. Among them are the lack of synchronisation of the electoral cycle with the timescales needed to submit new policies to more rigorous testing, and the residual reluctance or incapacity of scientific professionals to get down and dirty with the bruising realities of social and political life. If it can be made to work, the rewards will be palpable. The libel reform and Science is Vital campaigns, for example, have already borne fruit. I’ve had the opportunity to be involved in both of these but my favourite story in the book is the one about the maxillofacial surgeon who applied science to tackle the problem of bar brawling in Cardiff (the wonderful details of which I will leave you to discover for yourself). The Geek Manifesto is a impassioned book. It is a political tract, written with a sense of urgency. It might run the risk of irritating those too ready to accuse science of over-reaching itself but Henderson lives by example, showing a healthy respect for standards of evidence and critique that he advocates for all of public policy. A central message is that geeks and politicos need to better understand one another. For too long they have occupied sets with little overlap and that needs to change if society is to make a better fist of solving its problems. I would like to see a copy of The Geek Manifesto on the desk of every minister, every MP and every local councillor in the country; and, speaking of my own constituency, one in every laboratory too. This entry was posted in Science & Politics and tagged geeks, politics, skeptics. Bookmark the permalink. Many of the examples discussed are UK based but since the problems — and possible solutions — are fairly generic, I’d say there was international relevance. There is also some mention also of particular problems in the US, but nothing about Canada as far as I can recall. Sorry!